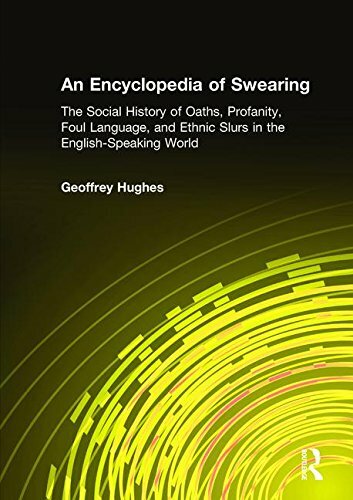 This is the only encyclopedia and social history of swearing and foul language in the English-speaking world. It covers the various social dynamics that generate swearing, foul language, and insults in the entire range of the English language. While the emphasis is on American and British English, the different major global varieties, such as Australian, Canadian, South African, and Caribbean English are also covered. A-Z entries cover the full range of swearing and foul language in English, including fascinating details on the history and origins of each term and the social context in which it found expression. Categories include blasphemy, obscenity, profanity, the categorization of women and races, and modal varieties, such as the ritual insults of Renaissance "flyting" and modern "sounding" or "playing the dozens." Entries cover the historical dimension of the language, from Anglo-Saxon heroic oaths and the surprising power of medieval profanity, to the strict censorship of the Renaissance and the vibrant, modern language of the streets. Social factors, such as stereotyping, xenophobia, and the dynamics of ethnic slurs, as well as age and gender differences in swearing are also addressed, along with the major taboo words and the complex and changing nature of religious, sexual, and racial taboos. View More In Human Resources.